Yeah, you could use a USB drive with some sort of software security feature, but it's probably only a matter of time until eastern European hackers crack that code. However, as this isn't Men in Black, you're already in possession of an excellent method of identifying yourself: your fingerprints. 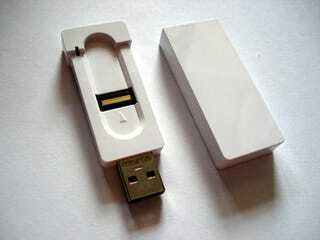 A-Data's FB1 USB drive scans your fingerprints on first use and identifies those fingerprints as the owner's. From then on, if you want to access the data on the drive, a simple fingerprint scan unlocks the drive. If, for some reason, your digits become unavailable, there's also a backup password system. This fingerprint scanning USB drive is available in 256MB, 512MB, 1GB and 2GB sizes, with the largest drive retailing for $59.99.